Our boss, Permanent Secretary Jonathan Slater, posted last week over on the Civil Service Blog about how we’re working to make the Department for Education user-centred. This post sets out a bit more about what we mean by that, and what we’re doing about it. The Department for Education has a huge number of diverse users - most people at some point in their life will come into contact with the things we fund and deliver. To do our work effectively, we need to go out of our way to understand who our users are and what they need. We need to do this in all our work, not just when we’re designing and operating digital services where user-centred design is the norm. All of us need to be involved. But 'being user-centred' is a new concept for many of us. We needed a working definition of what it actually means to be user-centred, something meaningful to all the more than 6,000 people who work here. For many of those people, our users are teachers, social workers, school leaders or people in local authorities. For others, our users are colleagues within the department. We had a fascinating and thought-provoking conversation on Twitter a couple of weeks ago, asking our wider community what they thought it meant to be user-centred. We’re hugely grateful to everyone who took part in that conversation - it really helped us develop our thinking. We then tested this this definition with colleagues and refined it a bit more. We’ve now arrived at 6 user-centred practices. These are our best articulation of how we can all be user-centred, no matter what work we do. When we’re developing policy, we often define the outcome we’re trying to achieve by talking about a whole system in abstract terms. For example, we might say we want to increase the number of people with a certain level of qualifications, or spend less money on a particular set of things. When we take this approach, we can lose sight of the actual people who are involved, what they need and how they are likely to behave. Being user-centred means that we also define the outcomes we're trying to achieve from the point of view of our users, based on what they actually need. For example, we want to make it easier for people to do a thing the have to do, or make it possible for them to do something they cannot currently do within our policies or services. This means going out of our way to understand what life is like in general for our users, visiting them often and watching them use our services. It means making sure we understand the full diversity of our users and that we’re doing things in an inclusive way. And not just generally, but specifically. How do our policies or services meet needs, or change how users might behave? This means that we explicitly identify and test our assumptions about what our users need and how they will behave in response to our policy or service. This applies as much to the work we do to set standards and regulate services provided by others, as it does to the services we provide directly. This means that as well as consulting and observing our users, we work with them to co-create policies and services. This means that it’s not enough to just ask people what they think, because that does not always give you an accurate understanding of how people will feel and behave in real life. We need to observe people’s actual behaviour, in context, using a range of techniques to give us valid and useful findings. Observe what users do, not what they say they do. This means rather than developing policies and services until they are ‘finished’ and then unleashing them onto the world, we start small, learn, adapt and iterate. This is an established practice in digital service delivery that we want to apply across the whole range of our activities. Over the next few weeks, we’re going to start talking to every team in the organisation about this list of practices, and how people can apply it to their work. We’re conscious that this should not be a lecture. We do not want to talk at people. We hope to inspire conversation and curiosity and help people take action. 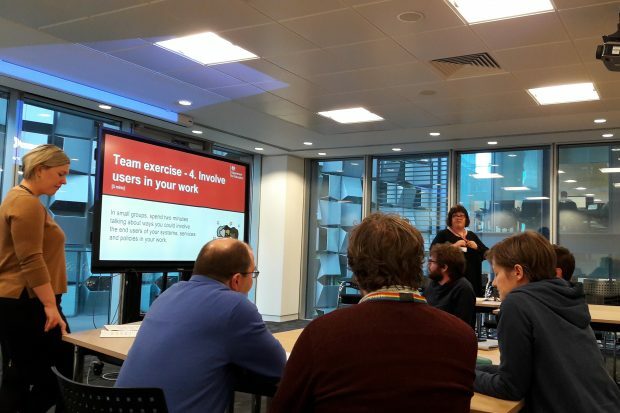 The goal is to help colleagues across the Department for Education make users a central and entirely normal part of daily work and conversations. We'd love to hear what you think. Leave a comment below, and subscribe to our blog to hear more about what we're doing to help the department support its users. Emma Stace is the Department for Education's Director of Transformation and Chief Digital Officer. Janet Hughes is the Director of Major Projects and Head of the Project Delivery Profession. All I want is our countries top authorities to read this blog and implement it in India as well. Thank you for sharing. Do you think this can be adopted effectively in an organisation that hasn’t been through the process of workshops with its staff to get to this working definition? I’ve been interested in the work you are doing since I saw a tweet saying you had brought 230 leaders together for workshops and had 6,000 staff to communicate the definition to. That must have taken tons of organising to do! There are small pockets of people practising UX at my organisation (size 1,200+) but I’m certain it will never truly become part of our culture until we do something like you have done and go through the process of creating our own working definition so that we have true intent and focus. A move away from centrally designed solutions which are implemented locally toward locally generated solutions which are supported by regional, provincial/state or national governments would go a long way toward allowing for more responsive, agile and effective problem-solving. It would also mitigate some of the polarization of problem-solving agents (policy people blaming failures on local teams for poor implementation vs local teams blaming failures on policy people for poor policies and planning). The farther physically and further hierarchically someone gets from the user, the harder it is for them to remember why they have their job.